I'll keep this straight. 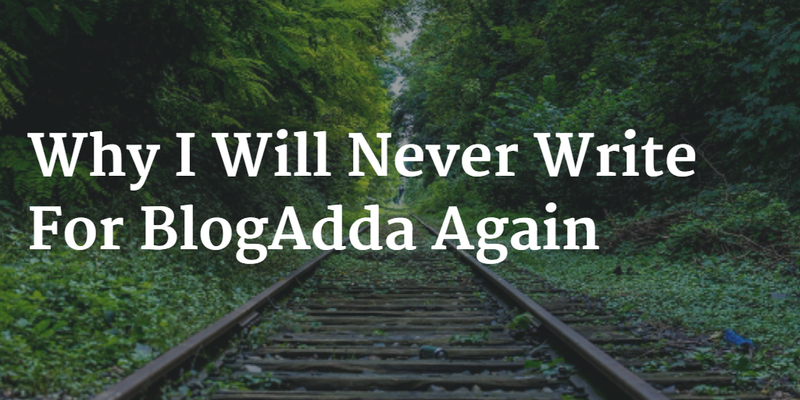 My love affair with BlogAdda is ending. And I am so glad it's finally over. From past one year, I kept dragging on. I was lovelorn and stupid, holding on to a belief that something better was in store for me. Since early 2014, the blogging community in India has grown significantly. Thanks to influencer marketing campaigns across the country, small businesses like BlogAdda have started to flourish. Most of these companies have discovered an easy way to engage brands with bloggers - via contests and events. I don't like contests per se. Ironically, I keep participating in them. If thinking about winning in contests is a crime, I'm guilty as charged. I spend hours in researching information and interviewing people, preparing drafts by including text, illustrations and videos, editing and publishing posts, promoting them via social media, and much more. If you think all of this is easy, well, think again. God only knows how much sacrifices I had to make in order to pursue my passion to blog. I don't watch TV anymore, hardly get any time to sleep, have a protruding belly, and my wife and children constantly nag about not spending enough time with them. The last thing I want to see is indifference and bias. I'll get to that a bit later. For now, I'll talk of how BlogAdda and I grew apart in distance. These words from Ankita Vadhel (Head - Marketing, Sales & Alliances at BlogAdda.com) don't do it for me. "You run a business too. You know how things work." She was referring to a general inquiry from yours truly on why she chose to be unfriendly at an event where BlogAdda was a media partner. Indeed, everything has become an effing business these days! "We are pleased to inform you that BlogAdda has recently associated with MTV India for their reality show MTV Roadies. Under this association, few chosen bloggers will be able to witness behind the scenes action of MTV Roadies 9 auditions live! The chosen bloggers, will be able to enter the gates with a special pass, without standing in long queues, and capture the madness inside. Also, this will give a chance for the blogger to interact with the production people and talk to the participants. You can be among these special chosen bloggers, and be at the audition venue to witness it all live! You should then blog about what you felt and your experience of being at the venue." The thing that struck me the most was their repeated use of "chosen bloggers". After three long years of sweet nothings, I get a masterpiece from BlogAdda yet again. This time with regard to 'A Billion Ideas meet'. Luckily, I was in India this time. "The full day event to be held on Sunday, February 23, 2014 at Radisson Blu, Mahipalpur, New Delhi, will have influential bloggers including you debating and discussing the future of our nation." You heard it, an invite to debate and discuss the future of our nation! The next mail was even funnier. "We are waiting to meet you this weekend. You are among the 30 shortlisted bloggers who will be discussing and adding awesome ideas to the billion ideas. We are happy to inform you that we are increasing the limit to 35 bloggers. As the privileged one, we want to ask you first if you want to bring along or recommend someone. Do let us know before 12 pm so that we can shortlist accordingly. It will be on First come First serve basis. :) Look forward to hear from you." Too bad, the event was canceled "due to the sudden hospitalization of a key dignitary who was going to be a part of the meet." C'mon BlogAdda! You can't be serious. You deprived me of being the "privileged one" ... ha-ha. July 2014. Around the time 'Mardaani' was going to be released, BlogAdda ran an awesome contest on their site with the tag line "Share your Mardaani Story!". The winners were guaranteed a chance to meet Rani Mukerji, the famous Bollywood actress. Writing for this contest was particularly difficult. Never an easy thing to share about someone's buried past! Here is the link to my winning entry. Go read about my Korean friend, Eun-kyong, who survived Stage 2 Breast Cancer and her husband's infidelity. Because I was one of the winners of 'I am Mardaani' contest, I attended a special screening at the Yash Raj Studios in Mumbai on August 22, 2014. "Our judges loved your post for its motivating story, sensitivity and its ability to strike an emotional chord with the readers." The same day, evening rather, I met Ankita and her young team face-to-face. Ankita seemed like a warm and friendly person. Senior too. Yet, she arrived late for the premier and had us fuming for almost three hours. BlogAdda never paid me a single rupee for my to & fro taxi fare from the Mumbai airport to the studio. But that didn't hurt as much as not getting to spend quality time with Rani. "3 winners with inspiring stories of living Mardaani women will be flown to Mumbai, if based in other cities, for a meet with Rani Mukerji, in a special screening of the film at Yash Raj Studios!" 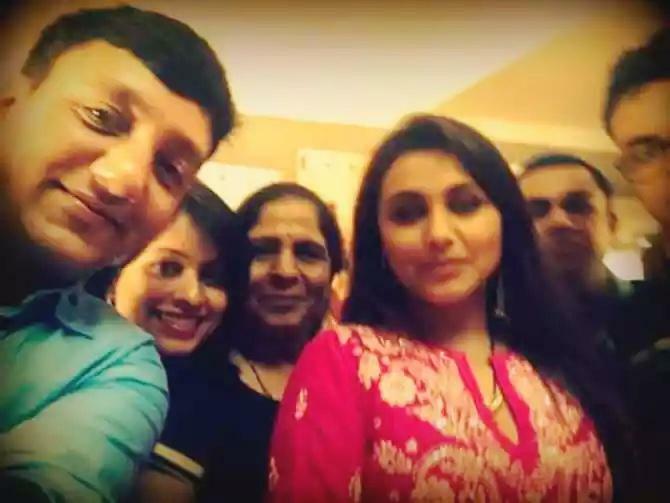 We could barely manage a selfie with Rani, leave alone meeting her up close and personal. And if the selfie came out blurred, you know who is to be blamed! Winning is addictive yet short-lived. I was among the runners-up for the INK Activity and had won myself a pass for the INK Live Conference held at Mumbai. The conference registration cost for a working professional like me was a mere INR 2000, which BlogAdda was happy to sponsor anyway. But expecting me to spend on the air fare and hotel stay was a real bummer. My response to them: Thanks but no thanks! My short claim to fame, courtesy BlogAdda. I was featured alongside other bloggers on NDTV Prime's show called 'Heads Up'. Although blogging is not a hobby or a full-time profession for me, I thoroughly enjoyed being on the panel. Click here for more details. I represented BlogAdda at two partner events in Delhi: SHEROES and Content Marketing Summit (CMS) Asia 2015. Besides that, I also published a book review for them - Private India by James Patterson and Ashwin Sanghi. I wrote for over a dozen campaigns on BlogAdda but only won twice. The closest I came to winning anything - after those two initial wins that is - was when my team made it to the Top 12 in the Game of Blogs. Lady luck eluded me in all other BlogAdda campaigns I was a part of. Isn't hard to second-guess! The results for #CrashThePepsiIPL contest isn't out yet but it doesn't matter. When BlogAdda blatantly turned down a request to include my name in the blogger's list for Jim Corbett Park, it felt like the first in a series of unpleasant events - the kind that makes you cringe. Ankita's passive attitude was hard to fathom. Provide topnotch content for free and this is how they continue to treat you. As professional bloggers, let us not continue to accept a bad situation anymore. So what were the criteria for shortlisting bloggers on this trip? Here's a cold-blooded response from Ankita that left me speechless. "Unfortunately, we won't be able to share the short listing criteria with you. They are confidential." "We definitely think of you when we think of Delhi which is why we've shared as many opportunities as we can with you." Purposely left me out of #BoltDrives - a campaign where 15 Delhi based bloggers took the Tata Bolt for a spin. A man generally has two reasons for doing something like this. One that sounds good, and a real one. What was your reason, Ankita? Here is my post for this campaign, submitted minutes before I boarded a train to Luni from the Gurgaon railway station. "I preferred you for some opportunities." You shouldn't have, Ankita. That's tantamount to an admission of guilt. "I know there are more bloggers right now and lesser opportunities"
Is that why you think BlogAdda is in a good spot? "There are constraints and limitations when it comes to smaller events. We do what we're expected to do." You call that event smaller, Ankita? Really? So what's with the recent post on your blog? "#BoltDrives gives Delhi bloggers a taste of royalty!" It has been a few days already since I requested BlogAdda to delete my credentials from their site. But they won't move the needle until Nirav (CEO, BlogAdda) is back from his business trip. I'm so done with you, BlogAdda!